Japan National Press Club has the following facilities on the 9th and 10th floors available, for fee, for the members' use when they are not used by the Press Club for its own press events. the largest facility, suitable for large scale press events, capable for approximately 210 seats with four-channel simultaneous interpretation. 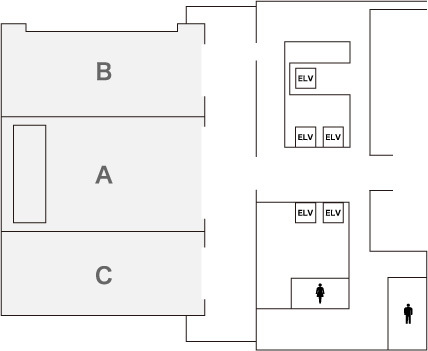 The hall can also be partitioned into three small rooms: A, B & C. The Hall can also be used for a large scale buffet party where some 300 people can be accommodated. the second largest facility for a medium size (approximately 70 seats) press conference and meeting. Simultaneous interpretation system (two-channel) is available. About 80 people can be accommodated for a buffet gathering. this room is capable of having 30 seats at maximum and suitable for a small scale press conference/briefing and meeting with no simultaneous interpretation system. About 40 guests can be accommodated for a buffet-style gathering. the smallest conference room with capability of having 20 seats. these two small rooms are located adjacent from the Alaska restaurant on the 10th floor. Gold Room is suitable for 14-seat meeting and Silver Room for a meeting of 16 seats. there are two restaurants for the members' use on the 9th and 10th floors. The 9th floor restaurant serves Japanese meals and the one on the 10th western cuisines.